Biographical text and endnotes copyright © 2006 by Timothy Conway. Milarepa (repa, “cotton clad”), “by far the most famous saint of Tibet,” established, with the help of his guru Marpa and his own disciples, the strongly meditative, mystical and devotional Kagyü school of tantric Vajrayâna Buddhism in Tibet. Jetsün Milarepa is universally venerated throughout that country as its most powerful and heroic yogi-sage. He is certainly one of the most interesting and beloved figures in all of spirituality—an outstanding exemplar of Jesus and the Buddha’s commandment to “love thy enemy.” Mila’s case is paradigmatic: he overcame evil—others’ evil and his own evil —to become a superhuman Buddha in one lifetime. His is a life of sincere effort, tireless dedication, and amazing austerity culminating in supremely enlightened wisdom and all-embracing compassion. Born in southwest Tibet near the Nepal border, Mila Thöpaga (“a joy to hear”) lost his father Sherab Gyaltsen at age seven. Mila’s uncle and aunt were to care for Mila, his younger sister Peta, and their bereaved mother, Nyangtsha Kargyen, but instead the greedy kin took over the family estate and callously subjected Mila’s family to servitude, persecution, and humiliation. Mila’s mother gave her son a terrible ultimatum—either he learn black magic as a means to eliminate the uncle and aunt, or she would commit suicide. And so Mila spent years training among black magicians to the east, eventually returning with new sorcerer skills to wreak vengeance, at the behest of his hapless, vindictive mother, on those who had so disfranchised and hurt their family. With his magic power and the help of some subtle-plane demon allies, he caused a house to collapse, killing 35 persons at a party held by the aunt and uncle for his son—as fate would have it, only the uncle and aunt were spared by the demons. Next, he created a bad hailstorm that destroyed the villagers’ crops. Now, with their attempts to find and kill him, and his own massive guilt tormenting him over what he had done, a desperate Mila left home in search of a Buddhist teacher who could help him completely atone for and overcome in one lifetime his load of evil karma, otherwise he’d be going to hell for his misdeeds. He met Nyingma Buddhist teacher Rongton, who sent Mila to meet householder sage Marpa Lotsâwa (c.1012-98) at Trowo Lung in southern Tibet (near Bhutan). Marpa had twice bravely journeyed over the mountain passes down into India, spending 21 years in all, to obtain initiations, teachings and texts from the tantric scholar-adept-monk Nâropa (1016-1100). A hefty, fiery, yet dignified man, Marpa “quarreled with his colleagues and preoccupied himself with building and agriculture.” In their auspicious first meeting, Marpa appeared incognito, plowing as a farmhand, to size Mila up, then formally accepted him as disciple after hearing Mila’s past and testing him to see whether he wanted spiritual instruction or a more comfortable life of food and lodging in the Guru’s home. Mila vowed to do whatever it took to become a Buddha in one lifetime. In their first six years together, Marpa (nearly 30 years older than Mila) treated Mila like a servant: demanding, aloof, harsh, even seemingly cruel—he later admitted he was only purifying Mila’s karma, his earlier sins of sorcery. For instance, a famous episode tells of Marpa making Mila arduously build and then completely disassemble not one but four successive buildings—for no good reason. Finally, a disconsolate Mila, judging himself too evil to be given any teachings by Marpa, after almost committing suicide in despair, left to find another teacher, despite repeated reassurances from Marpa’s gentle wife Damema to stay and be patient. Though she knew that her husband thought extremely highly of Mila, nevertheless, she forged a letter of introduction for Mila to another teacher, Lama Ngogdun Chudor, under whose tutelage he began to meditate. Not making any progress, he confessed the forgery and the Lâma said that it is futile to aim for spiritual growth without approval from one’s root-Guru. So Mila journeyed back and was this time lovingly received by Marpa, who began to treat him as his most honored spiritual son along with his own son, a saintly young man who unfortunately died within a year or so. Marpa granted Mila secret, powerful initiations into the loftiest levels of Buddhist tantra view and practice. This tantra system aims to 1) divinize the yogi’s body, speech, and mind through mudrâs/gestures, mantras, meditations and visualizations of Vajradhara and other Buddhas and Bodhisattvas; and 2) help the male or female yogin realize the highest spiritual truth: the illusory nature of all appearances and the transcendent-immanent quality of Buddha-nature (buddhatâ, dharmakâya) or Pure Awareness: utterly formless yet pervading all forms. This Awareness or Buddha-nature is the “continuum” or “thread” (the literal meaning of tantra) underlying all phenomena, just as a single thread unifies all the flowers of a garland or the beads of a necklace. Mila then meditated in virtual solitude for 11 months, supported by Marpa and Damema, coming out only at his Guru’s behest for more teachings. He then returned to the mountains for years of further meditation and austerities, interspersed with visits from his Guru. Marpa made one last arduous trip to India to find Nâropa and get a tantric teaching to benefit Mila’s practice. The Mila Khabum, the candid autobiographical account given by Mila to his disciple Rechung, tells how Mila was impelled by a sad dream of his mother and sister to go find and comfort them; so, in a bittersweet farewell to Marpa and Damema, reassured by Marpa that they would meet again in another world, Mila set out west for home, but found only an empty house and his mother’s bones. He went into samâdhi (meditative absorption) for an entire week to invoke blessings for his late mother and father. Collecting alms from a few friends in the vicinity (and almost being killed by the aunt and uncle when he chanced near their tents), he retired into the big Dakar Taso cave in the nearby hills, vowing to refuse householder life for a life of total renunciation and perpetual meditation. The faithful Zesay, to whom Milarepa had been betrothed when they were children, came to see him, and was deeply impressed by his spiritual vow. To her he offered his deserted family home and field until his sister Peta could be found, but she graciously refused. Mila’s conniving aunt then came to see if she could take the property without being cursed by her nephew—he generously agreed and sang spiritual instruction to her, fearless in the face of her insidious hints that he might be killed. He not only forgave his aunt but actually thanked her and his uncle for being the major factor in his turn to spirituality. For the next several years, Milarepa, dressed in rags and then just a thin white cotton cloth or utterly naked, meditated in the often freezing Himâlaya caves near and on Chomolungma (Earth Mother Mountain, a.k.a. Mt. Everest), not too far from the family home, honing an inner attunement to Spirit. He ate very little, for one whole year subsisting only on nettle-broth amidst long periods of fasting; the nettles turned his skin a greenish hue. It was Mila’s awesome mastery of the Nâropa yoga of tummo that generates great inner heat, which kept him from freezing to death. In a poignant scene, his sister Peta and Zesay came to visit him, shocked at the sight of their emaciated kinsman. He inspired them with high-level spiritual teachings and over subsequent meetings turned them into ardent practitioners. His aunt came to him again, now sorry for her past sins; Mila gave her wise counsel that led her to adopt a pure spiritual life. It was during this period that, near death from extreme austerities, Mila opened an “emergency” scroll from Marpa: it presciently warned him to sustain himself with more food. Doing so, Mila was energized to break through into clear realization of the formless Void (Shîyatâ) at the heart of all existence and master the inner kundalinî yogic process. Various paranormal siddhi powers began to unfold in him. A great desire arose to go out and help liberate souls from their suffering, but his inner Deity counseled him to further hone his meditative mastery. Finally, his one earthen pot broke, bringing to absolute clarity the Buddhist teachings on the impermanence of all phenomena. Milarepa underwent full awakening from the egoic dream into perfect realization of Clear Light Awareness and its boundless, interdimensional capacities. Milarepa manifested astonishing miracles—e.g., healings, control of physical elements, levitation, bodily transformations, flying, bi-locating his form in remote places simultaneously. Once he was challenged by a Bön shaman-yogi to a wonderworking contest; to prove Buddhism a superior spiritual path to authentic awakening, Milarepa agreed and easily “outperformed” him. What most endeared Jetsün Milarepa in the hearts of the monks, nuns, yogis, laity, royalty, peasants and merchants who visited him was his clear, authoritative spiritual instruction on their behalf. He usually sang these counsels in lilting poetic hymns. A stirring blend of sublimity and earthiness, soulful strength and gentle humor, pervades these teachings. Many of his songs speak of the beauty of this dream-like world, but underline the terrible danger of being enslaved by one’s unwholesome karmas. In his 84th year, Jetsün Milarepa knew he was ready to leave earth-plane existence. A jealous, rich scholar-lama, Geshe Tsakpûhwa, tried to show he was more learned than Milarepa but was instructed by Mila that mere learning is no great achievement. Feeling humiliated, the Geshe made his concubine go offer Mila some tasty milk-curd that he laced with poison. Mila, staying up at Drin Cave hermitage with disciples, clairvoyantly knew of the Geshe’s intent to kill him, but also knew that it was time for him to pass on—for he was old and his chief disciples were fully enlightened. So, after insuring that the Geshe fulfilled his promise to give the concubine a valuable turquoise, Mila went ahead and drank the poisonous curd. No illness seemed to manifest. The curious Geshe came to see Mila and feigned sympathy when Mila admitted to being quite ill. Mila, by miraculously transferring the toxic energy to the nearby wooden door and shattering it, and then transferring just some of the same energy to the insincere Geshe, stunned the man, reducing him to remorseful tears. Mila forgave the Geshe, took on his sinful karma and counseled him on living a life of piety and humility. Despite the illness, Mila then walked down to the town of Chûwar, along the way showing a “multi-location” miracle of simultaneously appearing to his disciples in various far-flung places. At the Driche Cave above the town of Chûwar, Milarepa spoke his last spiritual instructions to a throng of devotees, sang a song of gratitude and enlightenment, and then expired. Spectacular interdimensional phenomena—rainbows, light shows, flower showers, unearthly fragrances and sounds, seen around Milarepa on earlier occasions—this time were seen in abundance as celestials honored him. Mila miraculously revivified his corpse for the sake of his disciple Rechung (1088-1158), who had hastened from afar to see his Master. Grief turned to joy as Mila sang for him one final song of Truth. Then Mila dropped the body, resuming his Formless Dharmakâya Identity and his subtle-energy Sambhogakâya “enjoyment” body for personally blessing and guiding disciples and future followers. Dâkinûs, female deities, flew off with Mila’s remains for themselves, leaving no relics in the cremation area, only a sphere of light. A will left by Mila directed disciples to his “stash of buried gold”: they found just a white cotton cloth, a lump of brown sugar, a cutting knife, and a note explaining how these would be miraculously transformed by him so as to yield unending pieces of cotton and sugar for all his devotees as talismans of blessing. The note also joked, “for me, the entire cosmos has been transmuted into gold; no need have I to tie gold up in hidden packets!” He lovingly, reassuringly promised eternal guidance from on high to all who thought of him. Milarepa had foretold that among his celestial disciples, goddess Tserinma, and among his 27 fully awakened male/female human disciples, the Kadampa monk-scholar-physician Gampopa (1079-1153) would be the two chief propagators of his mahâmudrâ wisdom and the Kagyü school in Tibet. The teachings were synthesized by Gampopa and his successors (Pakdru Dorje Gyalpo, Jigten Sumgön, et al.) 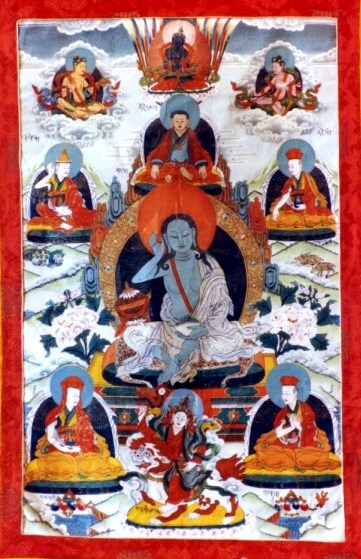 as the “fivefold path of mahâmudrâ”: 1) generating selfless love, compassion and bodhicitta (a mind of enlightenment for benefiting all beings); 2) yidam visualization / Deity Yoga; 3) devotional Guru Yoga; 4) mahâmudrâ wisdom realization; and 5) generous dedication of merit accrued from these practice for the welfare of all beings. These practices are the heart of the Kagyü school of Tibetan Vajrayâna Buddhism, which has been spiritually led for the last 800 years by Tibet’s longest-running line of tulkus (consciously reincarnating lamas), the Gyalwa Karmapas. (Karma Pakshi, 1206-83, the second Karmapa, was Tibet’s first declared tulku, or reinarnate lama/guru.) All Karmapas and Kagyü practitioners look to Jetsün Milarepa as their great inspiration. In this thangka image, Milarepa is shown surrounded by four of his leading disciples; above his head sits Marpa, showering blessings; above and to the left and right are the Indian tantric sages Tilopa and Nâropa. Above them all is Vajradhara, a personification of the primordial Buddha-principle. Note that Milarepa is usually shown iconographically with his hand to his ear. 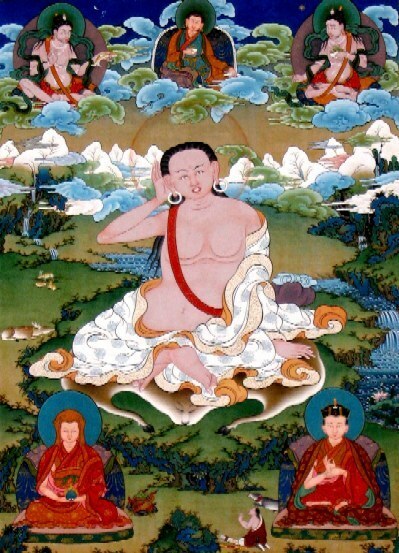 This symbolizes both his reception of the secret tantra teachings/practices from the lineage via Marpa, and also his own inner connection to the Source of all inspirational and liberating wisdom, which, in turn, Milarepa expressed to his followers in his spontaneous songs of enlightenment. 1. See W.Y. Evans-Wentz (Ed. ), Tibet’s Great Yogi Milarepa: A Biography from the Tibetan, being the Jetsün Kahbum or Biographical History of Jetsün Milarepa (Lama Kazi Dawa-Samdup, Tr. ), Oxford U. Press, 2nd ed., 1951; and Lobsang Lhalungpa (Tr. ), The Life of Milarepa, Boulder, CO: Shambhala ed., 1984, a more readable version largely based on Jacques Bacot’s French translation of the Jetsün/Mila Khabum. This wonderful Tibetan work purports to be Milarepa’s autobiography recorded by his close disciple Rechung. For a complete translation of another important text, “perhaps the most outstanding masterpiece of Tibetan literature,” the Mila Grubum, with its 61 stories of Mila and extensive teachings, see Garma C.C. Chang (Tr. & Ed. ), The Hundred Thousand Songs of Milarepa: The life-story and teachings of the greatest Poet-Saint ever to appear in the history of Buddhism (2 vols. ), Shambhala ed., 1977 (now in a new edition by Kessinger Publ., 2006; first publ. in 1962 by University Books). Both the Mila Khabum and Mila Grubum apparently were written by an unknown author, the “Mad Yogi of Tsang” (1452-1507). See also Lama Kunga Rimpoche & Brian Cutillo (Tr. ), Drinking the Mountain Stream: Further Stories & Songs of Milarepa, Yogin, Poet, & Teacher of Tibet, NY: Lotsawa, 1978, and Miraculous Journey: New Stories & Songs by Milarepa, Lotsawa, 1986 (the first has 18 selections, the second has 35 selections of songs and stories of Milarepa not found in the Mila Khabum or Mila Grubum). A beautifully illustrated children’s book is Eva Van Dam’s The Magic Life of Milarepa, Tibet’s Great Yogi, Shambhala, 1991, excerpts at http://c-level.com/milarepa/. Reginald Ray, “Mi-la-ras-pa,” Encyclopedia of Religion (Mircea Eliade, Ed. ), NY: Macmillan, 1987. Milarepa’s story is told at several websites: e.g., www.kagyu.org/karmapa/kag/kag05.html. 2. In addition to the Kagyü, three other major schools of Tibetan Buddhism persist: 1) the oldest, the Nyingma school (founded by the legendary Padma Sambhava and his consort Yeshe Tsogyel in the 8th century); 2) the Kadam / Gelug school (founded by Atisha, 982-1054 and Tsong Khapa, 1357-1419), which the Dalai Lamas have led; and 3) the Sakya (f. by Konchok Gyalpo and son Kunga Nyingpo in the late 11th century, based on the teachings of the yogin Drokmi). 3. The town of Kya Ngatsa or Tsa is in the highlands of Gungthang, a bit west of the north side of Mt. Everest. 4. Nalanda Translation Committee, The Life of Marpa the Translator, Boulder, CO: Prajna Press, 1982. 5. On Tilopa and Naropa, see Herbert Guenther, The Life & Teachings of Naropa, Oxford U., 1972; Keith Dowman (Tr. ), Masters of Enchantment: The Lives & Legends of the Mahasiddhas (Robert Beer, illus. ), Rochester, VT: Inner Traditions, 1988 / London: Arkana, 1989. 6. See Gampopa, The Jewel Ornament of Liberation (Herbert Guenther, Tr. ), Berkeley, CA: Shambhala, 1971. Descriptions of the meetings and exchanges between Milarepa and the 27 enlightened disciples can be found throughout the Hundred Thousand Songs of Milarepa. Mila’s travels and meetings with disciples are very briefly synopsized in Ch. 8 of the Jetsün Kahbum autobiography. An anthology of hymns of gratitude and enlightenment by later Kagyü masters, read annually to celebrate Milarepa, is the Kagyü Gurtso, “Ocean of Songs of the Ka-gyüs,” composed by the 8th Karmapa, Mikyö Dorje, c.1542; an English transl. by the Nalanda Translation Committee is The Rain of Wisdom, Shambhala, 1980. Of the many works on the “fivefold path of mahamudra,” see Kunga Rinchen’s (1475-1527) Clarifying the Jewel Rosary of the Profound Five-Fold Path, translated as The Garland of Mahamudra Practices (Khenpo Könchog Gyaltsen & Katherine Rogers, Tr. ), Ithaca, NY: Snow Lion, 1986. A fine short synopsis of Kagyü mahamudra teachings is by Garma C.C. Chang’s mentor, Lama Kong Ka, in “The Essentials of Mahamudra Practice as given by the Venerable Lama Kong Ka,” in Chang (Tr. ), Teachings of Tibetan Yoga, University Books, 1963. 7. Except where a different translator is noted (e.g., Evans-Wentz or Lhalungpa’s translation of the Mila Khabum), all translations are by Chang from the Mila Grubum, with page numbers identified. Note: I have only excerpted passages from the first 180 pages of the Grubum’s 675 pages. The interested reader does well to procure and read in its entirety this great classic of world spirituality. You can buy the Hundred Thousand Songs of Milarepa (Garma C.C. Chang, Tr.) in its new reprint edition by Kessinger Publ. at amazon.com at this link.